Books « Where Stars Are Born! Our skin is our largest and most vulnerable organ. Love it and it will love you. Protect it and it will protect you. Abuse it and it will shorten your life. There have been more chemicals developed in the last twenty years than in all of mankind. Of the 20,000 chemicals in use in the cosmetic, personal care and household products industry, less than 1% have been tested for safety. A few years ago I read something from the Center for Disease Control that ~63% of American claim to have a skin disorder. Connection? Probably! There are no US Government regulations for skin care or household products. 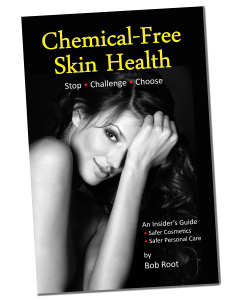 What I have come to believe is that more than 50% of skin disorders are misdiagnosed and are caused by chemicals in the products we use every day. This book is a perspective on the chemical world we live in and why I believe all of us should be concerned for our lives and the lives of our families, friends and the animals that share our lives. This book is not intended to scare you, although it might. It is really to draw attention to what our lives have become and the chemicals, companies and products that rule it. When I started this book, I felt totally unqualified to write it. After all, I am not a chemist nor do I fully understand the art and science of chemistry. I do understand, study and live in the quantum world of small particles, machines and reactions. I think this gives me a perspective that might just be new and unique. As I climb to 100,000 feet and look back at the history of chemicals in our lives, I realize how relatively short lived this industry has been operating under the new chemical standards. It is merely a blip in history. Even In its short life, concerned people have periodically raised questions about chemicals that are supposed to be safe that turned out to harm us and even harm generations. Whether it was a pesticide like DDT or a prescription drug called Thalidomide, these chemicals we later found to cause severe harm to humans in one form or the other. It is also not just about what is wrong. I am reminded of outliers like Adele Davis. Adelle Davis was the author of four bestselling books: “Let’s Cook It Right”, “Let’s Have Healthy Children”, “Let’s Get Well”, and “Let’s Eat Right To Keep Fit”. Adelle Davis was a visionary born it 1904. When going back through her history it is amazing to realize the impact Adelle had on the most recent and popular diets that are the craze now. Adelle Davis was the pioneer of the nutritional revolution. Her teachings and writings influenced people striving for health and wellness long before my time. The point? We have to look at what we put on our skin both good and bad. Eliminate something’s and add others changing our behavior. As I began to write, I began to feel a bit more like a reporter. This then changed quickly to a responsibility to shine a spotlight on what I was seeing as a non-chemist formulator of natural skin care and pet care products. I felt as if there was no thread or conclusion that I could draw from the book until I had finished it. This is when the purpose of this book became clear to me. Simply put, whether you read past this book or not, the one thing that you should glean from it is that we as individuals are responsible for our own lives. This includes what we put on to and in our bodies or what we choose to be exposed to in the environments in which we live. Take charge of your life is the message. If you choose to trust that the government will protect you, that a doctor will cure you or one of those activists will shed light on what is wrong in our world, you are naive at best.